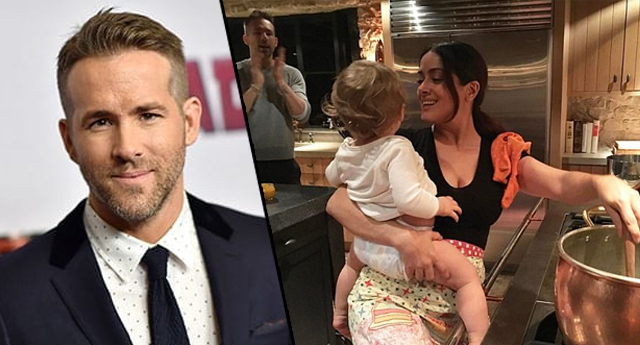 Salma Hayek has posted a new Instagram pic of her cooking for and babysitting for her Hitman’s Bodyguard, Ryan Reynolds. She commented on the domestic picture, ‘When your friends invite you for dinner and you end up doing all the work’. Salma looks right at home, donning a flowery apron and stirring the dinner as she hold’s Ryan’s baby daughter, Ines. Ryan can be seen clapping happily in the background. [Women] are a lot more demanding of ourselves than men are. It’s a horrible sensation. This picture certainly shows a sweet, homelier side to the two Hollywood A-listers.